Get 20% off Upholstery Cleaning - When you book us for Carpets (Min 4 Rooms) we will clean your favorite lounge suite and give you 20% Off. 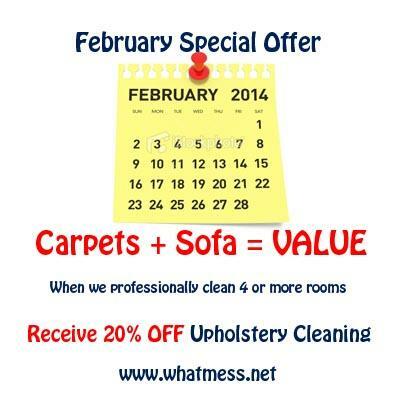 For the Month of February Only, book our Combo Clean, 4 or more rooms of Carpets to be professionally steam cleaned, plus book us to clean your lounge suite, and save 20%. We are trained and qualified to the IICRC industry standard, this means you get a great result from a professional company, we issue receipts on completion.